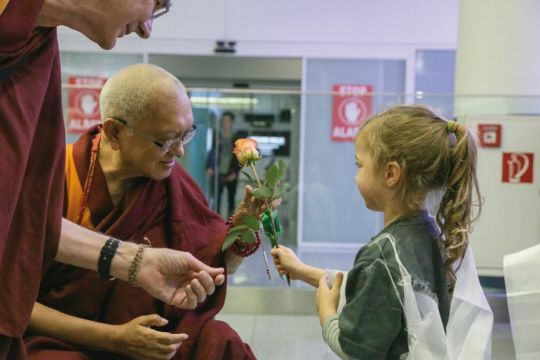 Lama Zopa Rinpoche received a pink rose from a young person wearing a white khata, Munich Airport, Munich, Germany, November 2018. Photo by Hermann Wittekopf. Aryatara Institut, a FPMT center in Munich, Germany, hosted Lama Zopa Rinpoche from November 3-12, 2018. Sabine Kehl, a long-term member of the center who manages Aryatara Institut’s Facebook page and translates for the center shares the story. After months of preparation and anticipation, the time had ﬁnally come. Lama Zopa Rinpoche arrived at Munich Airport on the evening of November 3, 2018. He was warmly welcomed by our FPMT resident teacher Ven. Fedor Stracke, representatives from Aryatara Institut, and many students who joyfully greeted him with khatas and ﬂowers. We all felt embraced by Rinpoche‘s generosity and kind heart. 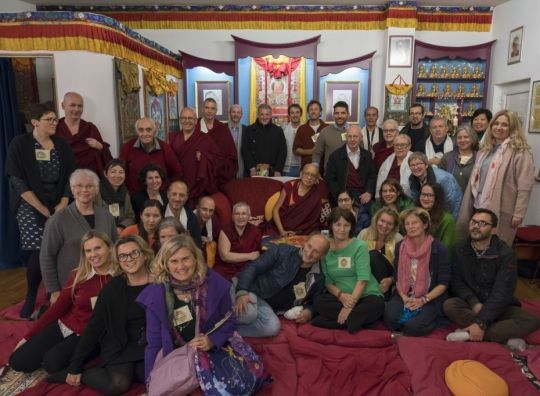 Lama Zopa Rinpoche with the FPMT Europe Regional Meeting participants, Tara Mandala Center, Landau, Germany, November 2018. Photo by Ven. Lobsang Sherab. Rinpoche spent his first week in Munich in private retreat at a wonderful rented house in a quiet area of Munich. The house had been lovingly decorated and prepared for Rinpoche, Ven. Roger Kunsang, Ven. Holly Ansett, Ven. Lobsang Sherab, and Ven. Lhundup Tobgye. During this week Rinpoche found time to attend the FPMT Europe Regional Meeting which was held at Tara Mandala Center, a FPMT center in Landau, Germany. 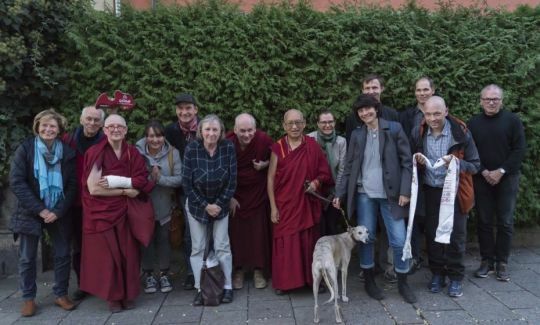 Lama Zopa Rinpoche with volunteers and sponsors of the Munich event at a short informal visit to Aryatara Institut, Munich, Germany, November 2018. Photo by Ven. Lobsang Sherab. Rinpoche made a visit to our center, where he gave a very inspiring talk to about fifty volunteers, sponsors, and students who founded our center in 1980. 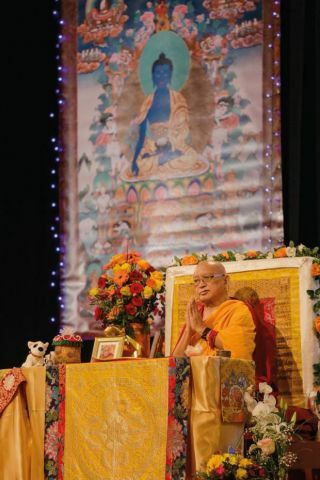 He thanked all those who helped organize his stay and all those who made it possible for Aryatara Institut to make Dharma in the Mahayana tradition accessible in Munich and Germany for nearly forty years. An especially heart warming experience was when Rinpoche handed out little toy pets he had blessed to all of the volunteers. We all love our new furry friends who carry Rinpoche’s blessing and remind us of Rinpoche every day. This private visit to our center was a wonderful and rare opportunity for all of us, especially for those who had not met Rinpoche before. Aryatara Institut resident teacher Ven. 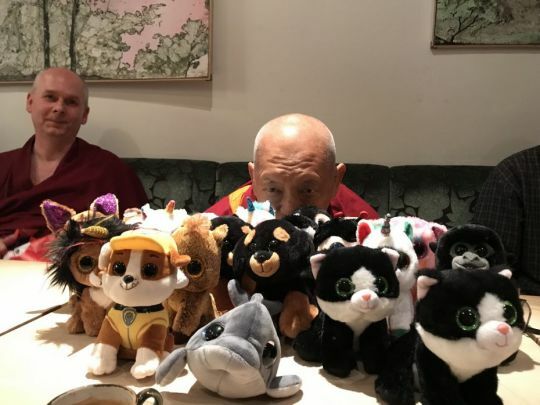 Fedor Stracke and Lama Zopa Rinpoche with the little toy pets Rinpoche blessed, Munich, Germany, November 2018. Photo by Alex Volk. The big weekend of teachings and a Great Medicine Buddha initiation finally began on Friday, November 9, at 7 p.m. at Reithalle Munich. Four hundred students from all over Europe and even India were eager to attend Rinpoche’s teachings. 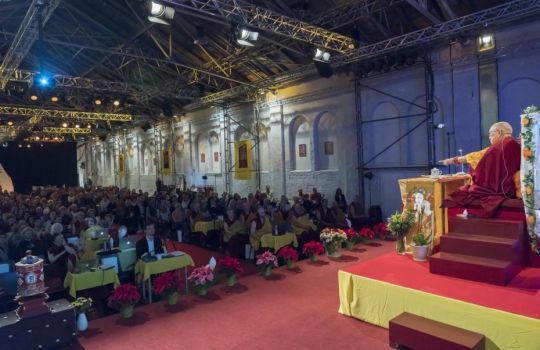 Lama Zopa Rinpoche teaching at Reithalle München, Munich, Germany, November 2018. Photo by Ven. Lobsang Sherab. Rinpoche‘s teachings were inspiring, heart-warming, and full of wisdom. Thanks to German language translator Ven. Fedor Stracke, Italian language translator Ven. Siliana Bosa, French language translator Ven. Losang Gyaltsen, Czech language translator Jitka Pouzarová, Spanish language translator Ven. Paloma Alba, and transcriber Ven. Joan Nicell everyone was able to follow Rinpoche’s amazing and wisdom-ﬁlled words. Lama Zopa Rinpoche gave the Great Medicine Buddha Initiation at Reithalle München, Munich, Germany, November 2018. Photo by Hermann Wittekopf. In the mornings Ven. Fedor Stracke held review sessions translated into German by Philip Quarcoo. These sessions were also met with great interest. The big weekend came to a close at 1 a.m. on Monday, November 12, with the conclusion of the Great Medicine Buddha initiation. Rinpoche left Munich for Bern, Switzerland, later that day, following a quiet lunch at a vegan restaurant. Ven. Fedor Stracke, Aryatara Institut board members, and a few students waved Rinpoche goodbye as his car departed our city for Bern. 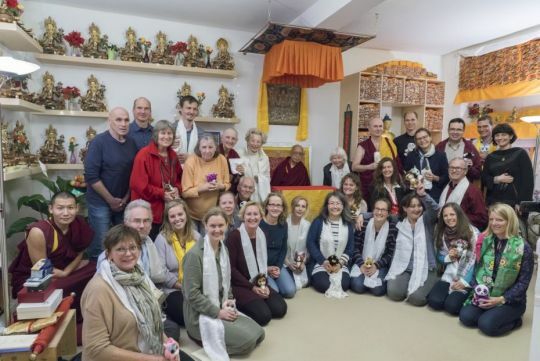 The inspiration and beneﬁts all of the students, event organizers, and volunteers received from Rinpoche’s visit to Munich will surely last for a long time. We all hold the memories of these remarkable days dear in our hearts. Lama Zopa Rinpoche with Annelies van der Heijden, past Aryatara Institut director Alnis Grants, recently ordained Ven. Jangsem (Burgel Noris), children’s program coordinator Cora Boer-Sakals, board member Hermann Wittekopf, former board member Inge Siebenwurst, resident teacher Ven. Fedor Stracke, director Rosana Rodrigues-Herzog, Sabine Kehl, dog Jamie who attended all teachings and received blessings from Rinpoche, spiritual program coordinator Robert Schwabe, board member Thorsten Schrammek, board member Alex Volk, and Thomas Herzog after lunch at the vegan restaurant, Munich, Germany, November 2018. Photo by Ven. Lobsang Sherab.